BACKGROUND: Cardiovascular diseases are the major public health problem in many countries and are responsible for more than half of the deaths in above 50-year-old women. The most common curable risk factor of these disorders is hypoestrogenemia resulting from menopause. The present study aimed to investigate the effect of melatonin on plasma lipid levels in menopausal women. MATERIALS AND METHODS: The present double-blind, placebo-controlled, clinical trial was conducted in 2013–2014 on 240 menopausal women between 40 and 60 years old referring to the Gynecology and obstetrics clinics of Shiraz University of Medical Sciences who were randomly divided into two groups. The intervention group received 3 mg melatonin tablets and the control group received the placebo for 3 months. The data were gathered using the demographic information questionnaire and lipid profile test before and 3 months after the intervention. Then, the data were analyzed through the SPSS statistical software (version 16). The repeated measures analysis of variance, the least significant difference, the independent-sample t, the Chi-square, and Fisher's exact tests were done for data analysis. RESULTS: The two study groups were similar regarding the demographic and clinical variables at the beginning of the study. In the melatonin group, the amount of triglyceride increased from 140.34 ± 48.29 before the study to 151.24 ± 54.60 3 months after the intervention and no significant difference was observed between the two groups in this regard (confidence interval [CI] = 95%, P > 0.05). In addition, no significant difference was found between the two groups concerning low-density lipoprotein cholesterol level (CI = 95%, P = 0.125). CONCLUSION: Melatonin was not effective in reduction of lipid levels. However, further controlled studies are needed to be conducted on the issue. Melatonin (N-acetyl-5-metho xytryptamine) is synthesized from tryptophan amino acid in the vertebrates' pineal gland. Due to its aromatic, full electronic structure, melatonin as a strong antioxidant is directly combined with free radicals and metabolized as a final product. After passing through biological membranes, this hormone stimulates the expression of antioxidant genes and inhibits the pro-oxidant enzymes genes. In this way, it increases the antioxidant capability of cells. Therefore, melatonin is an effective antioxidant with direct as well as indirect antioxidant capabilities and seems to play a critical role in protecting the cardiovascular system because there is a general agreement that active oxygen radicals have a major role in cardiovascular pathogenicity, Studies have shown that melatonin is an important protective factor against the mortality resulting from cardiovascular diseases due to improving the lipid profile and decreasing morphological as well as histological changes of the heart. Cardiovascular diseases are one of the major public health problems in many countries and are responsible for more than 50% of the deaths in women over 50 years old. Cardiovascular diseases are associated with various factors the most important of which is older age. Before menopause, the risk of death resulting from coronary artery disease in men is three times more than women. However, the relative risk considerably increases in women after menopause. One of the most common and curable risk factors after menopause is hypoestrogenemia. Although the risk of myocardial infarction and brain stroke is 1.2 times lower in estrogen replacement therapy, no prospective trials have been conducted on advantages and cardiovascular risks in this method. For instance, vaginal bleeding which is representative of malignancy in normal conditions may be attributed to hormone therapy and delayed diagnosis of malignancies.,, Various studies conducted on the issue have also come to contradictory results regarding the effect of hormone therapy on prevention and treatment of cardiovascular diseases. The effect of a daily administration of melatonin for 1.5 month on lipid peroxidation and lipid profile in rats in Subramanian's study was shown a significant decrease in lipid peroxidation and the levels of cholesterol, phospholipids, triglycerides (TGs), and free fatty acids. Several studies were shown the hypolipidemic effects of melatonin.,,, In addition, Wakatuski et al. were shown that no significant increase was found in the total cholesterol levels using melatonin. Probably, melatonin can be effective in improving lipid levels by affecting various body organs. Thus, the present study aims to investigate the effect of melatonin on lipid levels in menopausal women. The present double-blind, placebo-controlled, clinical trial was conducted from January 2013 to August 2014 on 240 menopausal women between 40 and 60 years old referring to selected Obstetrics and Gynecology clinics of Shiraz University of Medical Sciences. Individuals were invited to participate in the study through eight public calls in the city. Considering the power of 80%, confidence interval (CI) of 0.95, and significance level of 0.05, 100 women were assigned to each study group. According to the loss rate of 20% and in order to find a difference of 14% (effect size: 0.14) in the severity of the climacteric symptoms according to the results of Wakatsuki's study, sampling was continued until 240 women (120 in each group) volunteered for taking part in the study according to the CONSORT method [Figure 1]. Before the beginning of the study, women were provided with comprehensive information about menopause, cardiovascular diseases, melatonin, and study objectives so that they could make up their minds for taking part in the study. Then, written informed consents were obtained from the participants and they were told that they could stop their participation any time they were unwilling to continue. The inclusion criteria were good general health based on Goldberg's questionnaire (<23 score), being married, 40–60 years of age, not taking vitamin supplements, not having used hormone therapy during the last 3 months, being completely healthy in physical examinations (not suffering from liver, kidney, and gastrointestinal diseases), cessation of the menstrual cycle for at least 6 months, and follicle-stimulating hormone (FSH) above 40 IU. On the other hand, the exclusion criteria of the study were not being interested in continuing participation in the study and showing allergic reaction to the drug. It should be noted that anytime the inclusion criteria of the study were violated, the case was excluded from the study. At the beginning of the study, 5 cc blood samples from the brachial vein after 12 h fasting in morning were obtained from all the participants in order to determine levels of FSH and lipid profiles including low-density lipoprotein (LDL), high-density lipoprotein (HDL), TG, and cholesterol were determined using an enzymatic method, with Pars test kits and the LDL values were calculated using Friedewald formula. Then, the participants were divided into two groups through sortation. In this study, the participants and the researcher who were responsible for performing the interviews and examinations were unaware of the participants' allocation to the study groups. Furthermore, the medications were packed and given to participants by the researcher's assistant based on certain codes written on completely similar packages. Melatonin tablets were prepared by Nature Made Company, US, similar tablets made of lactose, avicel, and magnesium stearate in the same form and color as the melatonin tablets were used as the placebo. Each package included thirty 3 mg melatonin tablets or the placebo and was given to participants at the beginning of the study and at the end of each month. It was explained how to use the medications (one tablet every evening between 6 and 9 pm for 3 months) and data collection was done before and 3 months after the intervention. Also, the participants had two phone numbers of researcher team for any questions during study. The participants were also required to return the tablets they had forgotten during the last month when receiving the new package. Although previous studies have not considered the number of forgotten tablets as an exclusion criterion, forgetting the tablets for 7 consecutive nights, the researchers were considered as one of the exclusion criteria in the present study. Participants who had not completed taking the supplement during the study were excluded, as well. Data collection was done before and 3 months after the intervention using the demographic information questionnaire (age, menarche age, menopausal age and date of the last menstrual cycle, length of marriage, systolic and diastolic blood pressure, and body mass index [BMI]) and lipid profile test. In each visit, a questionnaire including three sections about complications of the medication, its advantages, and the degree of satisfaction and tendency to continue the medication use was also completed. Finally, the data were entered into SPSS statistical software (IBM – Company, Armonk, NY-USA, version 16) and were analyzed using t-test and Chi-square test. The Medical Research Ethics Committee of Shiraz University of Medical Sciences approved the present study (code: 91-6384). Before the beginning of the intervention and enrollment, comprehensive information about the study objectives, melatonin, benefits and probable side effects, type of the intervention (that the participants might be assigned to either group), length of the intervention, and follow-up was provided to the participants to make up their minds for taking part in the study. Then, written informed consents were obtained from the participants and they were given two phone numbers to call in case they had any questions. They were assured of the confidentiality and anonymity of the study. At the beginning of the study, 680 women were screened according to our inclusion criteria and 240 participants were divided into two groups among whom, 101 participants in the placebo and 98 ones in the melatonin group continued their cooperation with the researcher up to the end of the study [Figure 1]. The mean age of the participants was 53.22 ± 4.21 years. No significant difference was found between the two groups regarding demographic and clinical variables, such as age, menarche age, date of the last menstrual cycle, length of marriage, weight, BMI, and lipid levels before the intervention (CI = 95%, P > 0.05) [Table 1]. Regarding the effect of melatonin on TG level, no significant difference was observed between the melatonin and placebo groups (CI = 95%, P = 0.94). Furthermore, no significant difference was observed in the placebo group in this regard before and after the intervention (CI = 95%, P > 0.05). However, a significant difference was found in the melatonin group regarding TG level before and after the intervention (CI = 95%, P = 0.034) [Table 2]. The results of the present study revealed no significant difference between the two groups regarding cholesterol (CI = 95%, P = 0.097), LDL cholesterol (CI = 95%, P = 0.152), and HDL cholesterol levels (CI = 95%, P = 0.054). In the intervention group, 10.9 and 1.94 mg/dL increase was observed in TG and HDL levels, respectively. In the control group, on the other hand, these measures were reported to be 11.01 and 0.524 mg/dL, respectively. Moreover, although cholesterol and LDL cholesterol levels decreased in the intervention group, the difference was not statistically significant (CI = 95%, P > 0.05). Overall, 43 participants in the two groups complained about side effects during the study. Most of the patients complained about sleepiness, nausea, vomiting, headache, and vertigo. Nevertheless, bleeding and spotting were reported by only four participants in the melatonin group after using melatonin. No significant difference was found between the two groups regarding the complications of using the medications (CI = 95%, P > 0.05) [Table 3]. Furthermore, 65.31% (64) and 34.69% (34) of the patients in the melatonin and the placebo groups were satisfied with using the medication, respectively; this difference was statistically significant (CI = 95%, P < 0.05). 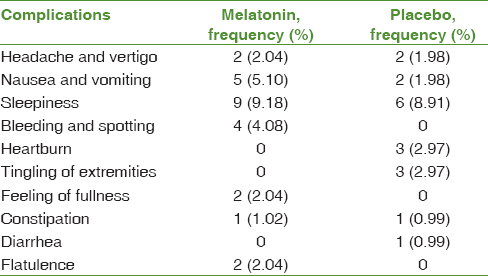 In addition, 51 participants (52.04%) in the melatonin group and 27 ones (26.73%) in the placebo group were willing to continue using the medication after the study and the difference between the two groups was statistically significant (CI = 95%, P < 0.05). Decreased estrogen in women causes lipoprotein lipase activity to increase which results in an increase in LDL. Nevertheless, no change can be observed in HDL levels as a protective factor against cardiovascular diseases. LDL is oxidized by the oxygen free radicals in the arteries and is converted to foamy lesions or atherosclerosis. On the other hand, melatonin removes oxygen free radicals and prevents LDL oxidative changes. In general, dyslipidemia and change in plasma lipid profiles are among the risk factors of cardiovascular diseases. Recently, more attention is being paid to melatonin for improving lipid profiles. The mediating effects of melatonin on plasma lipids and lipid peroxidation level have been reported in previous studies.,,,, Studies have also been conducted on the effects of this hormone on physiological as well as morphological changes resulting from high-calorie and high-fat diets. Using melatonin accompanied by zinc acetate significantly decreased plasma cholesterol, TG, and LDL levels. Most probably, melatonin improves lipid profiles through decreasing the oxidation of lipids and other necessary functional proteins by harmful radicals. Lipoprotein lipase hydrolyzes the VLDL TG and converts it into intermediate density lipoprotein (IDL) and HDL. Due to the activity of hepatic lipase TG, IDL can produce LDL and HDL2 is converted into HDL3 which protects the cardiovascular system. Yet, melatonin can also be effective through increasing cholesterol metabolism in the body. In any event, increasing plasma melatonin levels can keep the cardiovascular system healthy. Consistently, Lercher et al. revealed the reduction of melatonin levels in patients suffering from cardiovascular diseases. They introduced melatonin as a hormone which was directly involved in the micro- as well as macro-atherosclerosis processes of the coronary arteries., Furthermore, the results of the study by Wakatuski et al. showed that using melatonin led to a significant increase in TG, VLDL cholesterol, and VLDL TG levels, while no significant increase was found in the total cholesterol levels. Although TG level increased in the present study, this increase was within the normal range and caused no risks for the patients. Agil et al. have also stated the positive effects of melatonin on improving lipid profiles in diabetic fatty rats. Using melatonin by mild diabetics also improved the lipid profile, reduced TG, and increased HDL cholesterol. In the same line, one of the most recent studies showed that using melatonin by individuals with metabolic syndrome decreased TG, increased HDL cholesterol, and improved oxidative stress indexes. Koziro'g et al. was shown in their study that the melatonin is effective in patients with metabolic syndrome systolic blood pressure, diastolic blood pressure, and LDL cholesterol significantly improved after 2 months of melatonin administration. In patients suffering from type II diabetes with insulin resistance, increased TG results from the increase in production or the decrease in VLDL cholesterol lipoprotein lipase activity. Using melatonin is quite effective in these patients and research findings have shown that lipoprotein lipase activity is probably restored and hepatic acyl-CoA synthetase is inhibited by melatonin. Moreover, Sudhakumari et al. mentioned that the mediating effect of melatonin on plasma lipids was most probably associated with its antioxidant characteristic. They reported that increased levels of TG and LDL in diabetic patients were related to the oxidation capability of lipoproteins. In addition, the increase in the oxidation capability of LDLs led to progress of its oxidation, increased the possibility of accumulation of these oxidized particles in macrophages, blood, and vessels' walls, and caused atherogenic changes. In the present study, the two groups were similar regarding weight, BMI, and blood pressure which are among the effective factors in lipid level disorders; therefore, these factors could not have affected our study results. The findings of the present study revealed 10.9 and 11.01 mg/dL increase in the TG level in the melatonin and placebo groups, respectively, 3 months after the intervention. The study results also showed that melatonin intervention caused a significant difference in cholesterol, LDL cholesterol, and HDL compared to the baseline, which is in agreement with the study by Wakatuski et al. However, that study was conducted on 15 menopausal women, which is quite smaller than the sample size of the current study. On the other hand, the study conducted by Koziro'g et al. showed that melatonin intervention was not effective in HDL and other index of lipid profile in metabolic syndrome individuals. Although some studies have shown that melatonin can mediate the lipid levels through its specific mechanisms, such results were not obtained in this study. In fact, limitations such as short study period, change in participants' diet during the study, and incorrect consumption of tablets in spite of training can affect the results of this study. Although studies have introduced melatonin for reducing the micro- as well as macro-atherosclerosis processes, this function was not confirmed in the present study. Therefore, more studies are recommended in order to confirm the efficiency of this method. The present article was extracted from Nehleh Parandavar's proposal and was financially supported by the Office of Vice-chancellor for Research, Shiraz University of Medical Sciences, Shiraz, Iran. The authors would like to thank all the individuals who helped in conducting the research. The authors are also grateful to Mohsen Varzande for improving the English manuscript with his changes. The study was financially supported by Shiraz University of Medical Sciences. Hardeland R, Pandi-Perumal SR. Melatonin, a potent agent in antioxidative defense: Actions as a natural food constituent, gastrointestinal factor, drug and prodrug. Nutr Metab (Lond) 2005;2:22. Tan DX, Manchester LC, Fuentes-Broto L, Paredes SD, Reiter RJ. Significance and application of melatonin in the regulation of brown adipose tissue metabolism: Relation to human obesity. Obes Rev 2011;12:167-88. Guven A, Yavuz O, Cam M, Ercan F, Bukan N, Comunoglu C, et al. Melatonin protects against epirubicin-induced cardiotoxicity. Acta Histochem 2007;109:52-60. Speroff L, Fritz MA. Clinical Gynecologic Endocrinology and Infertility. 7th ed. Philadelphia: Lippincott Williams and Wilkins; 2005. p. 260-320. Danesh Kojori M, Saeed Fatami N, Mohammadi R, Naisani Samani, Safavi S. Women's Health in Life Cycle. 1st ed. Tehran: Nordanesh; 2009. p. 123-46. 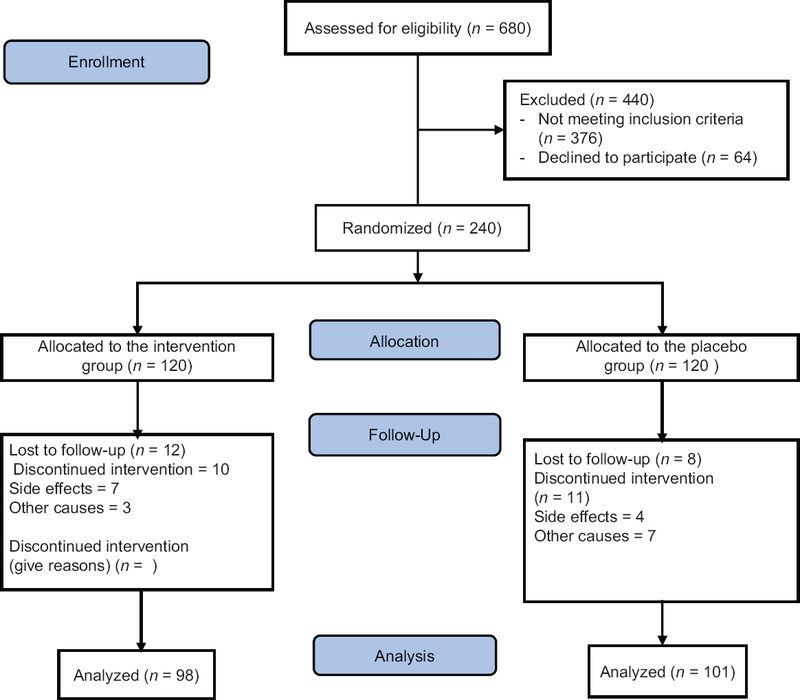 Parandavar N, Abdali K, Keshtgar S, Emamghoreishi M, Amooee S, Mosalanejad L. The effect of melatonin on sexual function among postmenopausal women: A randomized placebo-controlled trial. Nurs Midwifery Stud 2017;6:149-55. Moghassemi S, Ziaei S, Heydari Z. Comparative effect of the conventional hormone replacement therapy and tibolone on sexual performance in postmenopausal women. Arak Med Univ J 2011;14:104-13. Hall JE, Guyton AC. Textbook of Medical Physiology. 12th ed. Philadelphia: Elsevier/Saunders; 2011. p. 996-1026. Toffol E, Kalleinen N, Haukka J, Vakkuri O, Partonen T, Polo-Kantola P, et al. Melatonin in perimenopausal and postmenopausal women: Associations with mood, sleep, climacteric symptoms, and quality of life. Menopause 2014;21:493-500. Parandavar N, Abdali K, Keshtgar S, Emamghoreishi M, Amooee S. The effect of melatonin on climacteric symptoms in menopausal women; A double-blind, randomized controlled, clinical trial. Iran J Public Health 2014;43:1405-16. Subramanian P, Mirunalini S, Pandi-Perumal SR, Trakht I, Cardinali DP. Melatonin treatment improves the antioxidant status and decreases lipid content in brain and liver of rats. Eur J Pharmacol 2007;571:116-9. Hussain SA. Effect of melatonin on cholesterol absorption in rats. J Pineal Res 2007;42:267-71. Ismael S, Hussain S, Numan N. Hypolipidemic effect of melatonin in dyslipidemia associated with diabetes. Iraqi Postgrad Med J2004;3:223-6. Hussain SA, Hussein KI, Saieed BN. Improvement of the hypolipidemic effect of lovastatin with melatonin. Iraqi Postgrad Med J 2004;6:73-8. Al-Mahbashy H, Hussain S, Numan N. Effect of melatonin in oxidative stress, protein Glycation, microalbuminuria and lipid profile in type 2 diabetes mellitus. Iraqi J Pharm Sci 2006;15:17-32. Wakatsuki A, Okatani Y, Ikenoue N, Kaneda C, Fukaya T. Effects of short-term melatonin administration on lipoprotein metabolism in normolipidemic postmenopausal women. Maturitas 2001;38:171-7. Katzung BG, Masters SB, Trevor AJ. Basic and Clinical Pharmacology. 11th ed. New York: McGraw-Hill Medical; 2009. p. 240-375. García JJ, López-Pingarrón L, Almeida-Souza P, Tres A, Escudero P, García-Gil FA, et al. Protective effects of melatonin in reducing oxidative stress and in preserving the fluidity of biological membranes: A review. J Pineal Res 2014;56:225-37. Hussein MR, Ahmed OG, Hassan AF, Ahmed MA. Intake of melatonin is associated with amelioration of physiological changes, both metabolic and morphological pathologies associated with obesity: An animal model. Int J Exp Pathol 2007;88:19-29. Kadhim HM, Ismail SH, Hussein KI, Bakir IH, Sahib AS, Khalaf BH, et al. Effects of melatonin and zinc on lipid profile and renal function in type 2 diabetic patients poorly controlled with metformin. J Pineal Res 2006;41:189-93. Koziróg M, Poliwczak AR, Duchnowicz P, Koter-Michalak M, Sikora J, Broncel M, et al. Melatonin treatment improves blood pressure, lipid profile, and parameters of oxidative stress in patients with metabolic syndrome. J Pineal Res 2011;50:261-6. Dauchy RT, Blask DE, Sauer LA, Davidson LK, Krause JA, Smith LC, et al. Physiologic melatonin concentration, omega-3 fatty acids, and conjugated linoleic acid inhibit fatty acid transport in rodent hind limb skeletal muscle in vivo. Comp Med 2003;53:186-90. Wakatsuki A, Sagara Y. Lipoprotein metabolism in postmenopausal and oophorectomized women. Obstet Gynecol 1995;85:523-8. Tamura H, Nakamura Y, Narimatsu A, Yamagata Y, Takasaki A, Reiter RJ, et al. Melatonin treatment in peri- and postmenopausal women elevates serum high-density lipoprotein cholesterol levels without influencing total cholesterol levels. J Pineal Res 2008;45:101-5. Lercher P, Stoschitzky K, Sakotnik A, Liebmann P, Klein W. Melatonin in patients with coronary artery disease, hypertensive heart disease and dilated cardiomyopathy. Atherosclerosis 2000;151:203. Reiter RJ, Tan DX, Terron MP, Flores LJ, Czarnocki Z. Melatonin and its metabolites: New findings regarding their production and their radical scavenging actions. Acta Biochim Pol 2007;54:1-9. Agil A, Navarro-Alarcón M, Ruiz R, Abuhamadah S, El-Mir MY, Vázquez GF, et al. Beneficial effects of melatonin on obesity and lipid profile in young zucker diabetic fatty rats. J Pineal Res 2011;50:207-12. Mitra A, Bhahachrya D. Effect of melatonin in mild diabetics with dislipidemia. J Hum Ecol 2008;23:109-14. Sudhakumari CC, Haldar C, Senthilkumaran B. Seasonal changes in adrenal and gonadal activity in the quail, perdicula asiatica: Involvement of the pineal gland. Comp Biochem Physiol B Biochem Mol Biol 2001;128:793-804. Nishida S, Segawa T, Murai I, Nakagawa S. Long-term melatonin administration reduces hyperinsulinemia and improves the altered fatty-acid compositions in type 2 diabetic rats via the restoration of delta-5 desaturase activity. J Pineal Res 2002;32:26-33.